Best in Biz Awards recognizes top companies, teams, executives and products for their business success as judged by established members of the press and industry analysts. 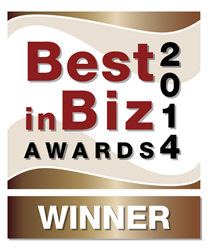 Best in Biz Awards honors are conferred in two separate programs annually: North America, and International. Entries will begin to be accepted in the Best in Biz Awards 2015 International program in January 2015. Any organization worldwide may participate in the International program in any of the more than 60 company, department or team, executive and product categories. For more information about the entry process and categories in the International program, please visit: http://intl.bestinbizawards.com. http://intl.bestinbizawards.com.